Hmm…Never thought of it in those terms, but I’ll give it a shot. I’ll use my terms. 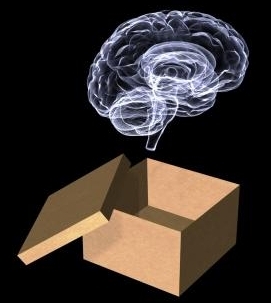 Let’s put the brain in a box. It has three holes, (we’ll skip smell me for the moment) labeled feel me, hear me, see me. We’ll put a wheel in front of the box. We reach out the feel me hole and discover the wheel. Nothing out of the hear me hole but we can visualize it out of the see me hole. Hmmm… lets put a dot on the circumference of this wheel and start spinning it. At about 20 HZ we can detect something out of the hear me hole. Let’s run this up to about 600 HZ. There we go, a nice solid hmmmm. (do on the musical scale) If we track the dot while rolling the wheel along a time scale we can see a sine wave and can invent trigonometry. This is the basis upon which the “scientific method” is based. Any data or logic that does not fit this framework is discarded. BUT, by applying appropriate logic to relevant data we come to the obvious conclusion that the universe is composed of vibrations, not matter. Standing wave is as good a word as any, I use “temporal river”, Plato used ether. Einstein used continuum. No matter, as the math is not the physics, the word is not the concept. Whichever you choose to use, something is doing the hootchie cootchie out there, and it’s not matter. All you can say about it (from an empirical point of view) is that it is vibrations having a circular or rotational component with a beat of 8 and is negentropic. So what is really happening? The right hemisphere receives the data in the frequency domain. Go here for a visualization. He only goes to fa, but it’s good enough. this is the perception of the vibrations. The left hemisphere does an interpretation of this and generates a tone. (do in this case) This tone is then quantified to form the sine wave. So we are left with a quantification of an interpretation of a perception which is accepted as reality. Scientists, mathematicians and physicists routinely use the Fourier transform to translate the time domain into the (imaginary) frequency domain, obtain the answer, and translate back. It seems the answers exist in the frequency domain that do not exist in the time domain. HOW CAN THIS HAPPEN? How can an imaginary domain contain more information than the real domain? It is like a map of Chicago containing more information that the actual city. It is oximoronic (heavy on the moron) The only conclusion that can be drawn is that reality is in the frequency domain, IE vector + amplitude IE vibrations. The time domain is imaginary, the frequency domain is reality. Not only are they on the wrong page, they’re in the wrong book. This entry was posted on July 25, 2010 at 8:30 pm and is filed under The Minds with tags box, brain, cognition, constructivist, counsiousness, duality, logic, logos, mind, mythos, perception, psyche. You can follow any responses to this entry through the RSS 2.0 feed. You can leave a response, or trackback from your own site.